Rising fuel costs have made fluid bed technology far less costly to operate than rotary dryers. To meet the demanding requirements of aggregate producers, Carrier has developed a line of fluid bed processors specifically designed for the industry. Sand/Aggregate Dryer Only – A single, high-temperature fluid bed that typically uses 30-40% less fuel than a rotary dryer. Dryer/Cooler with Recirculation – Warm exhaust air from the cooling section is re-circulated to the drying zone air heater, providing an additional energy savings of 10-15% and reducing the amount of air exhausted to atmosphere by up to 50%. Dryer/Cooler with Multi-Point Predictive Controls – A PLC-based control system is used to precisely control the condition of the product as it moves from the drying zone to the cooling zone, allowing the system to take advantage of the evaporative cooling effect that occurs when warm, slightly-moist sand is exposed to cooling air. This system prevents the discharge of hot or wet sand during upset conditions and further improves the energy efficiency by approximately 10%. Reliable Design – The new sand and aggregate dryer operates at just one “G” of vibrational force. This is the minimum required to ensure a dry, uniform product at the discharge, and energy-efficient fluidization. The dryer/cooler’s drive mechanism allows full adjustment of important parameters, such as amplitude, frequency and angle of vibration. The entire machine is dynamically isolated to reduce the reaction to the supporting foundation. 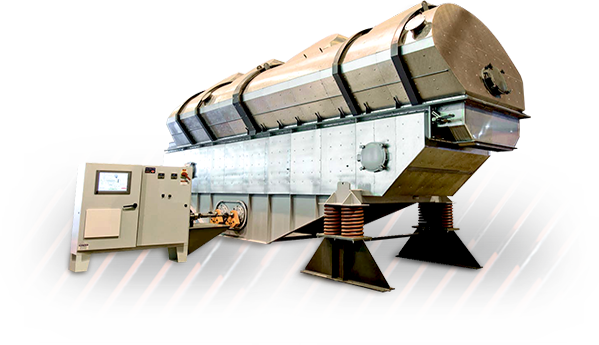 Insulation is attached with a steel skin and hot air is supplied to the machine through a flexible metal “bellow” in lieu of fabric flexible connectors. The result is the most reliable aggregate and sand dryer/cooler available today. Process Flexibility – A variety of Carrier sand and aggregate dryer/coolers system designs are available, each offering varying degrees of energy savings and capital cost.